Sally Bateman volunteered at Helping Hands in November 2014. She arranged her placement through our parent organisation Globalteer. Here’s her story. 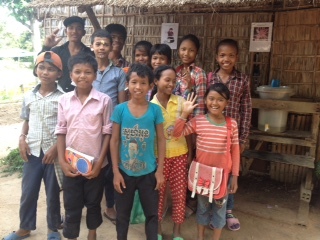 Volunteer Sally (far back, left, dark hair) with her class at Helping Hands Cambodia. You hear people say that they have had life changing experiences. This was it. At 56 and with my own children in their early 20’s I wondered if I would fit in, both at the school but also with the other Volunteers. I needn’t have worried. The volunteers I met on my first day will, I hope, remain lifelong friends. No matter our ages, we were all sharing an experience that would change us and create amazing memories. There was a lot of laughter and, when it was time to say goodbye, many tears. Students wait for class to begin at Helping Hands Cambodia. You can’t help but be affected by the Cambodian people. They have so little but give so much. Their smiles and warmth, acceptance of their life and appreciation of even the smallest things are very humbling. But it was the children at Helping Hands Cambodia that truly won my heart. My role in the school was to assist the teachers by working with the children on pronunciation and to allow them to hear English from a native speaker. I was also lucky enough to be able to prepare and deliver some very easy lessons – something I never expected to do but which I thoroughly enjoyed. 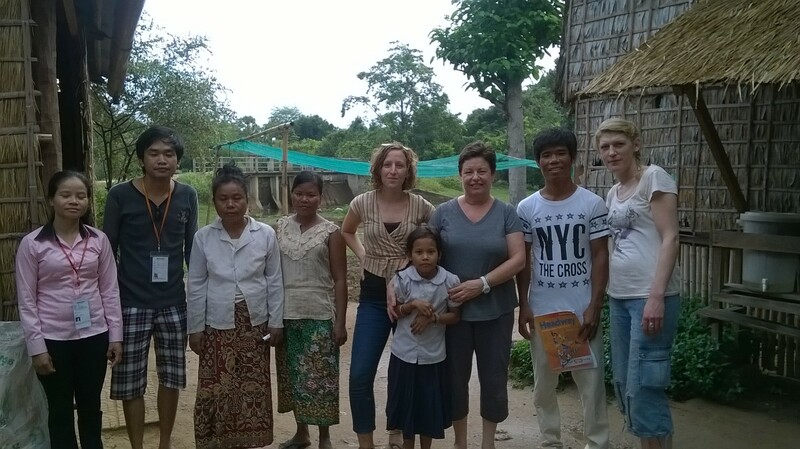 Sally (centre, right) with volunteers and staff at Helping Hands Cambodia. During my 2 weeks at Helping Hands I also visited the village homes of some of the children. It is obvious that the parents of these children, some of whom have no literacy or numeracy and suffer debilitating illness, are desperate for their children to have the opportunity of education that they didn’t have. Helping Hands is a big part of this. Some of Helping Hands’ dedicated students. Leaving HHC was a very emotional experience. All I did was give up 2 weeks of my time. In return I received the experience of a life time. The teachers and children of HHC are exceptional. 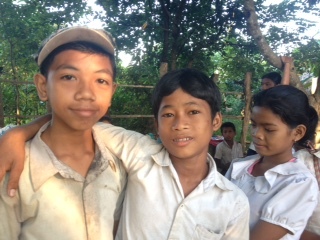 They are the future of Cambodia. Although they come from a very poor village that is barely accessible by road during some times of the year, with no electricity, plumbing or clean water these children aspire to be doctors, teachers, accountants and movie stars! I have no doubt that these dreams, for at least for some of the children, will be realised. My heartfelt thanks to the children and families of Prasat Cha Village, the teachers of HHC, the Project Coordinator, the Volunteer Coordinators and my lovely fellow volunteers for the most wonderful time of my life. I will be back. If you’d like to help out at Helping Hands you can learn more about volunteering with us here.